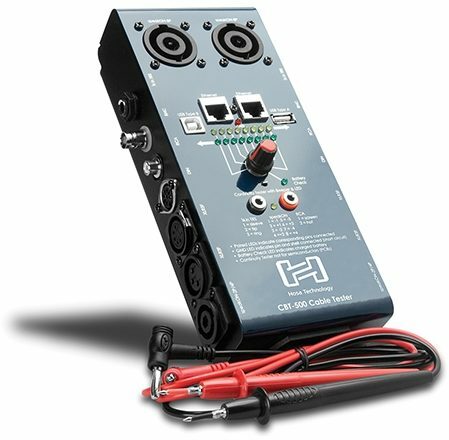 The CBT-500 Cable Tester by Hosa Technology diagnoses signal failure in cables terminated with any combination of XLR, Phone, Phono, and speakON connectors, as well as DIN, Ethernet, and USB Type A to Type B cables. It is also equipped with removable leads to verify continuity of additional connectors and jacks. Operation requires one 9-volt battery (included). - Test probes for continuity testing of bare wire and any connectors not found on the CBT-500. "Basic, well built, and multi-functional "
Overall: This has all the basic test-loop configurations and because of its end-to-end pin-out matching allows you to test cables with different connections at each end (i.e. TRS to XLR, TS to Speakon, etc.) If you understand pinouts you can easily use this to test insert cables and other non-standard and custom cables. Includes probes making it easy to test about anything for continuity. Built like a tank and both solid and easy to use. Overall: THIS THING IS AWESOME. I MAKE ALOT OF OUR BANDS CABLES AND I TEST THEM WITH THIS FIRST.. AWESOME TOOL. A TIME SAVER WHEN TROUBLE SHOOTING A PA OR GUITAR RIG WITH A BAD CABLE.. TAKES OUT ANY GUESS WORK... ALSO HAS TEST LEADS.